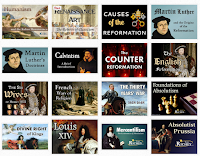 Last fall I featured Tom Richey's free PowerPoint and video collection for AP US History and AP European History students. Tom's YouTube channel is full of excellent tutorials for history students. In many of those videos you see Tom's face in the corner of the screen while PowerPoint slides support his points. Now Tom has started a video series about how to get the most out of PowerPoint. The first video in his new PowerPoint Playbook is about animating numbered lists. See the video below.